WE ALL like to think that football is more than just 22-28 young men kicking an object around an oblong field – if only because it elevates our interest beyond obsession to something that is more deep and meaningful! Journalists fantasise, marketing and advertising folk commercialise, romantics eulogise and academics intellectualise the importance of the game. Most of all, the people running, playing and promoting football (is it a sport or merely an industry?) monetise it on a grand scale. Joe Kennedy’s fascinating slim volume, Games without Frontiers, published by Repeater, adds to the growing library of work that takes a cerebral look at the game’s reason for being. It’s thought provoking, even if you don’t necessarily agree with some of the underlying sentiment. Football is many things, but “inherently political”? – I am not so sure. The majority of football fans do not see the game as a political expression (more so in England), although politically-motivated people will see things that others do not. I would certainly agree that football is rapidly becoming “a dystopian expression of late capitalist commodification” – a “free-for-all”. Football, at the highest level, is no longer the Game of the People, but the game of aspiration, of style over substance and a world dominated by intermediators – the marketers, advertisers, TV broadcasters, agents and hangers-on that not only add superficiality to the game, but also the cost of watching it. While there is strong evidence to suggest that football has been a form of controlled narcotic for the working man down the years, with clubs exerting a vice-like grip on people’s emotions and wallets, the game is a product of society rather than a change agent itself, regardless of the hopeful view held by some scholars. 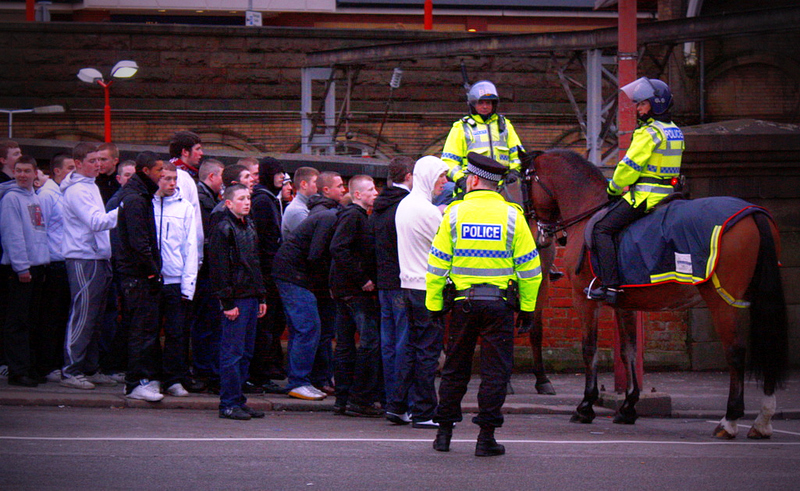 Rarely, in Britain, has football been a vehicle for political or social change. Certainly, the government has never appeared to see the value in embracing the sport as a passport for public acceptance. There has never, for example, been a character like Victor Orban of Hungary who has tried to use football as a way to win votes. The nearest I can recall is the old GLC leader Tony Banks, who got behind a campaign to save Chelsea from financial ruin in 1976, and that was because he was a fan of the club. Generally speaking, it is right wing/extremist governments that have harnessed football for their own gains, although the old Soviet bloc used sport as a demonstration of socialist strength and vitality. Football in Britain started out as clubby recreation (19th century) and entertainment for the working man (early 20th) in its formative years, evolving into collective “reins-off” relief in peacetime (Post-war boom), declining like post-industrial Britain (1980s) only to be born again in the age of mass media (1992-onwards). Football has been a reflection of society’s fluctuation, driven by a number of influencing factors – discretionary spending, togetherness and the desire to be taken out of the daily struggle. That’s not exclusive to England, either, for where would Spain have been in recent years without the pressure-absorbing exploits of Real Madrid and Barcelona? The Spanish government may have had more than mass unemployment and economic meltdown to deal with if it were not for its two flagship football institutions. Britain’s own economic problems contributed to the decline of football and it is likely that without the 1990s transformation, spurred by Italia ’90, the Premier and SKY, the game would have declined even further than it did. The old working class cloth-cap nostalgia model, which had been tarnished by hooliganism and discouraged by abysmal facilities, not to mention a club-fan relationship that was not unlike the capital versus labour dynamic of mill owner and downtrodden worker, had sent English football plummeting. Just consider that in 1970, the average top tier gate was 32,070 and by 1984, this had fallen to 18,834. It was not until 1999 that the average topped 30,000 again. By the time the 2000s arrived, the football audience had – whether you liked it or not – changed to include corporate executives on a night out (“you coming to the ball game?”), middle-class professionals and the emerging knowledge economy sectors that decided football was, after all, trendy and something to be attached to in some shape or form. The old audience – what Kennedy refers to as its “working class constituency” – dwindled, marginalised and alienated by extortionate ticket prices and the gentrification of the game. He points to the “decimation” of that body of people and its disenfranchisement to become economically excluded from watching professional football. There are exceptions to this rule, such as in Liverpool, where impoverished football fans of the old order spend huge portions of their income on football and football alone. We have certainly seen, particularly at clubs like Arsenal or Chelsea, that season tickets are no longer a means to an end, but something material, perhaps a currency, suggesting wealth and confident self-indulgence. Hence, Arsenal fans, as widely reported, don’t necessarily go to games even though they own the tickets. Clubs don’t appear to care too much – they have a long waiting list for season tickets and people even prepared to pay for the privilege of queue jumping online to buy tickets – if they are lucky. Where’s the motivation to change the status quo? But does this represent a crisis for football or merely changing demographics? There may well be a crisis emerging today in the actual quality of the game itself – the recent World Cup was a welcome return to an exciting competition. If you believe everything you read and hear, the game is, regardless of some dire teams and tactics, “wonderful”, “spectacular” and “captivating”. It’s the cappuccino effect – all froth and nothing underneath! With so much cash flooding the game, football has no excuse for being in a financial mess, even though some clubs have sub-optimal balance sheets and operating models. There is certainly no shortage of cash in football – crowds in England are close to all-time highs – but too much is disposed of so quickly and funneled towards a very transient workforce – the players. That said, compared to the past, stadiums are better and supporters are probably more connected to their clubs than they have ever been, despite the plethora of detached Russian, Asian and Middle Eastern owners in the English game with their protective glass screens and layers of “people” between them and the media. But those that yearn for football body that resembles the “People’s Republic of Walsall” will always be disappointed. Clubs are arguably more communicative, more responsive than they’ve ever been, but that’s not to say the world is perfect, because it is not – Charlton Athletic’s Pravda-style approach to social media a year or two ago takes some beating and takes you back to the pre-When Saturday Comes era when the voice of the fan was first heard. If there is democracy out there, it won’t ever be found in the Premier or Football League. Kennedy, in his book, focuses on a club that has experienced a rise in popularity through a quasi-political/social movement, but this is from the non-league world – Dulwich Hamlet. Actually, Dulwich are one of a handful of clubs that strive to combine the passion and engagement of the European flare-wielding “ultra” while sporting some left-wing attitude. Not everyone is totally comfortable with this and it has not come without problems, but Dulwich seem to have got it more right than others. A few rungs down from the Football League, the Game of the People still prevails, after all – the question is, is this a passing phase or a genuine social statement that will become contagious? We will all watch with interest…and a little hope, perhaps. Joe Kennedy’s book, Game without Frontiers, is part travelogue, part political commentary and a sprinkling of a Hornbyesque fan’s diary. Those interested in football’s position in society, the past, present and future, will find it stimulating and enjoyable. For 99.9 per cent of fans of whatever football club you follow, “togetherness and the desire to be taken out of the daily struggle” says it all. You could argue that Saturday afternoon football is more synonymous with religion than politics. It’s a quick read, but good material. Great piece, Neil. Certainly, football is largely apolitical in England but go to Glasgow, Hamburg (St. Pauli and Altona), Italy and especially Spain, and it’s a different picture. Way back at uni in the late 90s I wrote my “European Studies” dissertation on the role of football in Spanish regional identity. Keep up the great work, will share your piece across my network. Thanks so much for your comments. Glasgow, though? Religion more than politics? Very aware of political elements in continental Europe, though. Thanks again!